This project requires no additional hardware parts, but only the Arduino board itself. The idea for this project comes when I removed a buzzer from a Tandberg keyboard, this might be used for something fun. However the project became more of an exercise in creating a working Arduino Morse library. This project is using my Morse library. Use the Arduino board alone using the built in LED. Connect an external LED or buzzer, as you please. With this small program for the Arduino board, we can now send or print Morse code. 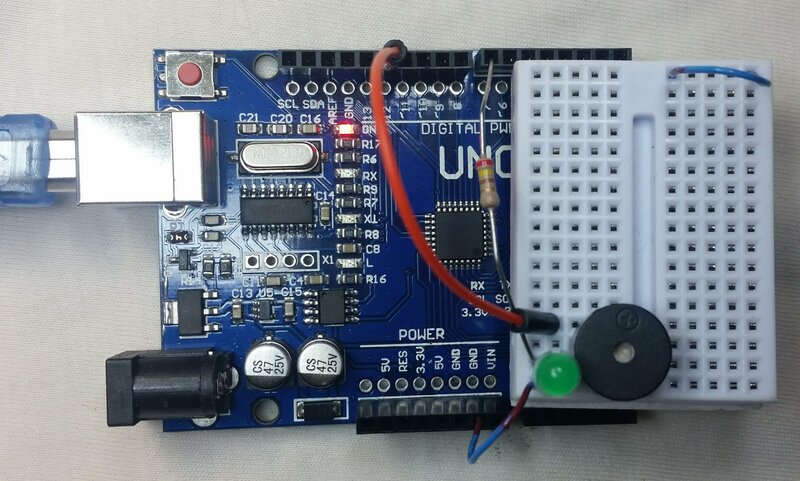 This program can be downloaded and uploaded to the an Arduino board using Xloader. After downloading you can connect to the Arduino board using f.ex HyperTerminal. 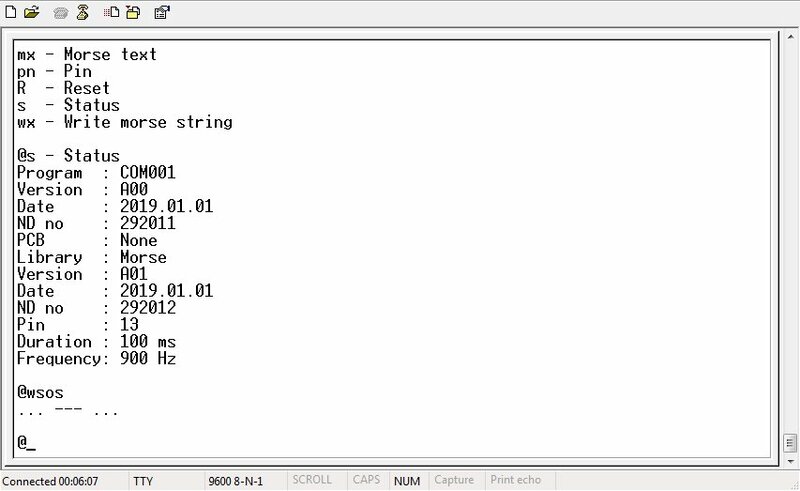 The program is using my own Arduino Morse library, version A00. a - Send the Morse code for the entire defined Morse alphabet. You can cancel this at any time by hitting any key. dn - Change the duration of a Morse dot, n is number of ms. All other durations are derived from this dot duration. fn - Change the tone frequency used if a buzzer is connected, n is frequency in Hz. h - Display the help screen. mx - Send the given text (x) as Morse code out on the defined output pin. pn - Change the output pin to be used, default is the built in LED, typical on pin 13. R - Reset the Arduino board (warmstart). s - Display the current program configuration/status. wx - Write the given text (x) as a string of dots and dashes. Do you have buzzers or LEDs that I can buy? Can I buy an Arduino Uno and/or Arduino prototype board from you? Yes, but IT IS much cheaper to find and buy it on the internet. Can you build or help me build this project? No, there is nothing to build. Can I have the Arduino source sketch so I can modify it myself. No, you can NOT. You have to write your own sketch.